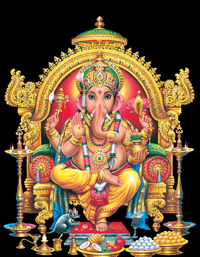 Ganesh Chaturthi 2011 or Ganesha Chaturthi 2011 this year falls on September 1st. It is believed that Lord Ganesha remains on this earth plane on this particular day to bestow His presence to all his devotees. This auspicious day is also known as Vinayaka Chaturthi or Vinayaka Chavithi. Ganesha is worshipped on a Chaturthi (4th moon) that is the day when Ganesha’s energy becomes available to the earth plane to the fullest. Hence, on Ganesh Chaturthi you can connect with him more easily than ever. The significance of Ganesh Chaturthi lies in the way in which people attach themselves with all their devotion and faith to the care and pampering of the all-embracing Lord Ganesha. According to Vedic Mythology, Moon and Lord Ganesha don’t get along well. The story goes to say that the Moon was proud of his beauty and insulted Lord Ganesha for his physical appearance. Lord Ganesha got furious and cursed the Moon to wane. This 4th waning moon is an appropriate day to perform pooja to Lord Ganesha as the Moon is debilitated on this day. What Does Lord Ganesha stand for? 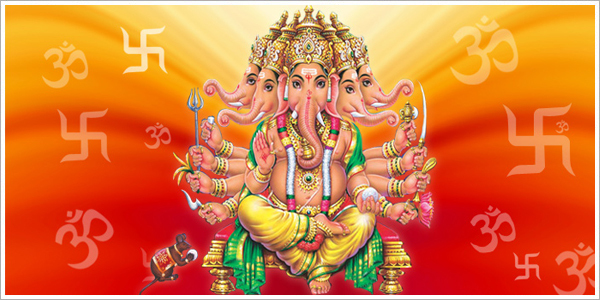 Lord Ganesha is the incarnation of wisdom and instant blessing. He holds a Pasha in one of His right hand to attract the minds of his devotees, to propel mankind forward on the eternal path and to remove obstacles from the way of his devotees, while the other hand bestows boons. One of the left hands that carry an Ankusha, symbolizes the demolishment of ignorance and a gentle execution to capture all the difficulties, while the hand that holds a lotus or a rosary, suggests that the quest for knowledge should not quench. Lord Ganesha is called Vighneshwara or Vignaraja the Lord of obstacles of material and spiritual order. His dharma is to remove obstacles because he knows obstacles as He personifies internal intelligence namely Sidhi and Budhi. Sidhi is the spiritual power or the capability to do things within a very short period of time through super natural powers while Budhi refers to intelligence or the discriminatory knowledge. So they are represented as his consorts. Therefore these qualities are personified as wives of Lord Ganesha, though He is referred to as an unmarried brahmachari. While Lord Ganesha is the personification of material universe in all its various magnificent manifestations, He is also the destroyer of vanity, selfishness and pride. Ganesha was the one deity who dared even to fight Lord Shiva. The primal emotion that leads to all types of confusions, conflicts and failure is fear and He is fearless. Lord Ganesha stimulates intelligence, enhances our problem solving skills, stabilizes emotions, removes obstacles and hand holds on to success. Offer Your Sincere Prayers To The Remover Of Obstacles This Ganesh Chathurthi.